Midnight in Paris is one of Woody Allen's best movies. One of its most enjoyable aspects is his deft use of Paris locations, some familiar, some not, to enhance the film's wistful and romantic mood. But perhaps its greatest triumph is the way Allen incorporates famous cultural icons of the past as elements of the plot and settings. The Fitzgeralds in real life. Alison Pill as Zelda, Tom Hiddleston as Scott Fitzgerald in the movie. Scott and Zelda Fitgerald were in Paris in 1925-6, as was Ernest Hemingway. The two frequented the Dingo Bar and talked, drank and even holidayed together. Fitzgerald was then at the height of his literary fame, the author of This Side of Paradise and The Great Gatsby. Hemingway seemed just another promising literary expatriate of the Jazz Age (a term Fitzgerald invented). But Fitzgerald was struggling with his writing, his alcoholism and his spiritually and psychologically troubled wife, and Hemingway was soon to become a major literary celebrity for decades, the author of brilliant short stories and novels like The Sun Also Rises and For Whom the Bell Tolls. His fame and reputation surpassed Fitzgerald's as the latter's personal life spiraled out of control. The two writers became friends: Fitzgerald admired Hemingway's writing and encouraged his efforts. Sometimes he gave the struggling author money. Hemingway was rather more ambivalent. He was annoyed by Fitzgerald's alcoholism and occasionally criticised his writing in public. Both he and Zelda ('I'm so full of confetti I could give birth to paper dolls') detested each other and Hemingway made it clear that he believed she was an addled airhead whose erratic and destructive behaviour was destroying Fitzgerald's immense literary potential. Few of these tensions appear in Midnight in Paris, although Allen depicts Zelda's flamboyant, flirty, independent nature. In the film she leaves her husband to go to another party, all too symbolic of what will happen in the near future. There have been few depictions of Fitzgerald in movies. 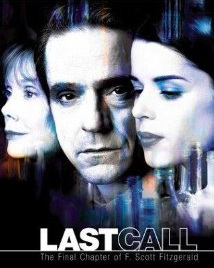 Jeremy Irons portrayed him in a rarely-s1990s tele-movie about his last days'. 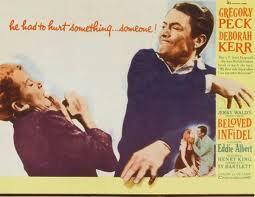 Gregory Peck played the author in a pot-boiler, Beloved Infidel. Jeremy Irons as Fitzgerald in a tele-movie. Gregory Peck in a film about Fitzgerald's post-Zelda relationship with Sheila Grahame. Peck as Fitzgerald in 'Beloved Infidel'. Hemingway writing in a Parisian cafe..
Corey Stoll as Ernest Hemingway. Stoll as Hemingway and Yves Heck as Cole Porter. Of all the cultural celebrities in Midnight in Paris, most attention has been given to the movie's portrayal of Hemingway. The actor Corey Stoll cleverly conveys the essentials of Hemingway's personality. He is at once a braggart , a bully, and a poseur, yet capable of kindness and sympathy, and deeply committed to writing and literature. Allen's screenplay captures the distinctive cadences of Hemingway's writing style, foever tottering on the edge of self-parody with its declarative sentence piled on top of each other, lacking subordinating conjunctions and with constantly repetitions of 'and'. 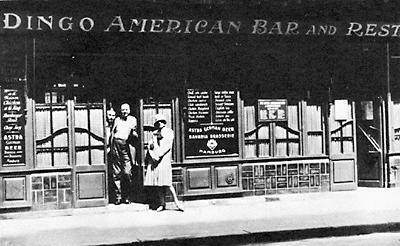 Hemingway's writing about meeting Fitzgerald in the Dingo Bar in Paris shows how Woody Allen has captured his distinctive style. "I gave up then and he asked me why I liked this cafe and I told him about it in the old days and he began to try to like it too and we sat there, me liking it and he trying to like it, and he asked questions and told me about writers and publishers and agents and critics .... (" A Moveable Feast", Restored ed. New York,2009). If you like Midnight in Paris, then you'll enjoy this account of Hemingway's time in Paris and other parts of France in the 1920s. The restored edition is the best: it has photos, sections omitted from the original edition and a good introduction. Although Hemingway's life would seem to offer great opportunities for good films, he has rarely been portrayed onscreen. Even a good director, Martin Ritt, failed when making a film version of episodes from the author's Nick Adams short stories, with an out of his depth Richard Beymer as Hemingway. The Dingo Bar, one of Hemingway's favourite drinking and writing spots. Read 'A Moveable Feast' for a description of a meeting with Fitzgerald here. La Coupole, since restored to what it was like when it first opened in 1927.One of Hemingway's dining-out restaurants, when he had the money. 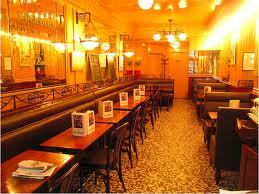 Interior of Le Select bistro, frequented by Hemingway, Picasso and Fitzgerald.